Cast-iron hardy, fragrant lilacs hold undeniable appeal for spring-hungry gardeners. Today’s cultivars offer larger flowers and more variety in color, scent as well as flower and shrub form. French hybrids are sweetly scented, while oriental varieties and their hybrids have spicy overtones. You can enjoy these flowering shrubs for about six weeks if you plant several types. Blooming begins with early-blooming hyacinthifloras, then goes to mid-season French hybrids, which are followed by late Preston hybrids. Because the shrubs’ flower buds form in summer, the current season of bloom is influenced by the previous season’s weather. The most abundant blooming tends to follow a cool, sunny summer. 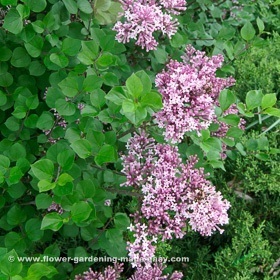 My favorite is ‘Palibin’ dwarf Korean lilac (Syringa meyeri ‘Palibin’), shown here. This cultivar flowers in mauve-pink in mid-May, and has a fresh, spicy fragrance. It tops out at about five feet tall, it’s a good choice for smaller gardens. This shrub resists powdery mildew and has a neat-looking mounded habit. It is also available as tree form (which means trained as a standard growing on a single stem). Most lilacs offer less ornamental value after flowering, so your best bet is use them as background plants in the garden, however, ‘Palibin’ with its attractive mildew-free leaves and smaller growth habit as in exception. Another compact-growing cultivar to consider is Syringa patula ‘Miss Kim’, which has mauve flowers. Recently introduced is Syringa ‘Bailbelle’, sold under the trade name Tinkerbelle, which has tubular pink flowers. It is a hybrid of S. meyeri ‘Palibin’ and S. microphylla ‘Superba’. Best time to plant: Plant in spring or fall; late April or early May and late September into October are ideal. Be sure to buy shrubs grown on their own roots, not grafted onto rootstock such as privet. Light requirements: Plant in an open area that gets at least five to six hours of direct sun in neutral to slightly alkaline fertile, loamy soil. Good drainage is a must: These shrubs will not tolerate standing water. In compacted heavy clay soils, plant them on raised mounds. Spacing: Most varieties grow into large shrubs, so space at least 10 feet apart. Place dwarf varieties about 5 feet apart. Mulch and water: Spread bark or wood chip mulch about three inches deep to the drip line to reduce weeding, conserve moisture and prevent damage from lawnmowers or string trimmers. Water shrubs well (about an inch of water per week), especially in early summer when flower buds forming. In dry periods, continue to water in late summer and fall. Feeding: These shrubs don’t need much fertilizer, although a balanced formula (7-7-7 or 12-12-12) applied after blooming once a year can be beneficial. 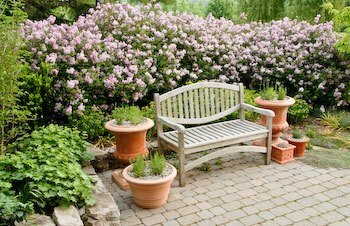 Give small shrubs a handful of fertilizer and larger shrubs two or three. Remove spent flowers right after blooming, so that energy goes into producing flower buds and not seeds. Once young shrubs are four or five years old, annual pruning is essential to ensure that you get flowers all over the shrub – not just at the top – and to encourage growth of healthy young stems, which produce better blooms than thick old ones. Because of their suckering tendencies, these flowering shrubs tend to outgrow their space if you don’t prune them. Prune immediately after flowering. Next spring’s flowering buds are produced in June and July, so avoid removing them with late pruning. Cut out 20 to 25 per cent of the oldest branches each year and take out any crossing stems.